Yes, I thought graduation from 4K was a bit silly. However, Samantha was nervous and excited at the same time. It is a big deal because the Kindergarteners are in a different building, they wear uniforms, and go to school all day. So, we said good bye to preschool. Kindergarten, here we come! 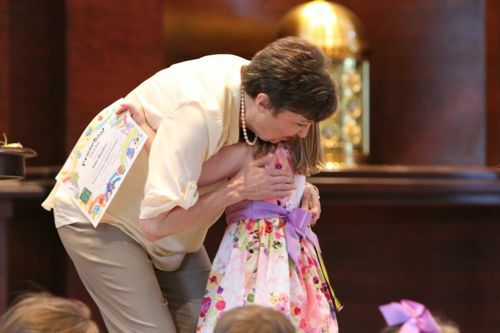 She received a diploma from the principal and a Dove pin (the school/church mascot) from her teacher. They processed in and out to Pomp and Circumstance, and sang a few songs in between. 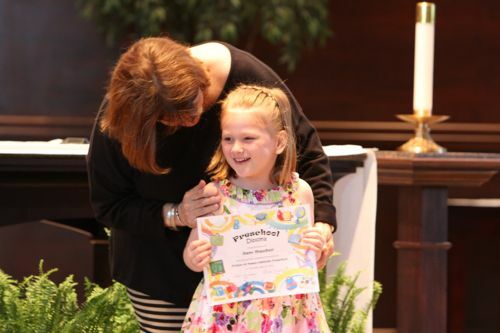 I can’t believe she’ll be in Kindergarten in a few months! Where have the years gone?